BROOKLYN — A developer in an asthma-ridden section of the South Bronx noticed something unusual about one of their smoke-free, eco-friendly affordable housing buildings in the area. The Eltona, Blue Sea Development’s first LEED Platinum building, had a lower rate of rent delinquency than other buildings in the company’s portfolio, according to firm co-founder Les Bluestone, who has been upping the ante when it comes to design features focusing on physical, social and mental health since constructing that building in 2009. Blue Sea hopes its latest project, Ocean Hill-Brownsville’s Prospect Plaza, will provide a model for affordable housing, showing that healthier buildings lead to healthier residents and better financial outcomes for developers — and the firm invited researchers from the Icahn School of Medicine at Mount Sinai to gather evidence. Prospect Plaza — part of which opened this summer — will eventually have 400 units spanning five buildings across three blocks is the first building to be certified as part of the Active Design Verified initiative, created by the New York-based nonprofit Center for Active Design and the the Washington, D.C.-based Partnership for a Healthier America (whose honorary chair is Michelle Obama). The initiative calls for design elements that encourage physical activity in everyday use, through on-site exercise facilities and well-designed stairs to get people moving, along with incorporating free or low-cost programming in the building to support health and social well-being, like gardening classes. In exchange, affordable housing developers receive training and technical assistance. 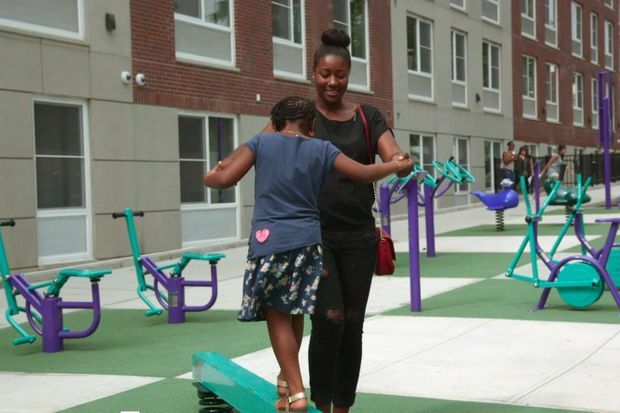 The program's creators say an emphasis on wellness is especially important in neighborhoods where access to safe streets, healthy food and well-maintained playgrounds are harder to come by. At Prospect Plaza, there’s a community garden with raised beds for tenants to tend. The strawberries, blueberries and raspberries the building planted in the area are part of the overall landscaping design, “adding to the fresh, pesticide-free produce available,” Bluestone said. Stairwells are well-lit, with plenty of sunlight coming in and speaker systems piping in music to encourage more residents to use the stairs instead of the elevator. There are outdoor bike racks and long-term bike storage indoors. A 24,000-square-foot supermarket is part of the complex. There’s also an indoor fitness center across the street at the second of three sites in the development that will be open in a few weeks to all residents, at no charge, giving tenants the chance to exercise in all weather conditions. Two separate outdoor recreational areas, totaling roughly 8,000 square feet, have fitness and playground equipment for children and adults to use side-by-side. A video about Active Design Verified from Partnership for a Healthier America on Vimeo. “It’s just about giving people the tools and opportunities to take care of themselves that many of us take for granted," added Bluestone, whose company is working in partnership on the complex with three other firms. In an area like Brownsville, creating such opportunities are critical. In 2011 and 2012 the area had the highest death rates of preventable diseases, as compared to the rest of New York City, according to the Office of Vital Statistics. Residents who won one of the 86 units in Prospect Plaza's affordable housing lottery — which targeted those earning about $51,450 for a family of four — were offered the chance to volunteer in the Sinai study when they signed the lease. Roughly 60 opted in so far. Sinai researchers also worked with Blue Sea at the Eltona, looking at asthma rates of residents. Results suggested the building may have reduced the burden of respiratory disease the area with high rates of asthma. But there were limitations to the study, such as not having a control group and having a self-selected group of residents who wanted a green, smoke-free building. Still, buoyed by the results, Blue Sea invited Sinai researches to study the firm’s next project, the Arbor House in the Morrisania section of the South Bronx, which will have active design features and a focus on obesity. After a year of living at Arbor House, 58 percent of residents reported an increase in the number of flights of stairs they walked up compared to 20 percent of residents in a non-active design building used as a control, the study found. Joanna Frank, executive director of the Center for Active Design, which issued a policy brief last week on the impact of active design in affordable housing, hopes the approach will become as popular as sustainability features have become, noting that incorporating the features at the start of a project does little to increase a project's cost. She hopes that retired neurosurgeon Ben Carson, who is President Donald Trump's nominee for Housing and Urban Development Secretary, will make design that promotes residents’ health a priority when it comes to affordable housing. “What we’re hoping to facilitate is that transition from the approach being the ‘one off’ and that ‘early adopter’ to taking it into the next phase and scaling it,” Frank said.